October is one of the best months of the year to visit Crete, Greece, when the temperatures are not as hot as the blistering summer months of July and August, but the weather is still warm enough to go to the beach. During this month, the average temperature for the island is 20°C, created by average highs of 24°C and average lows of 20°C. In October, the daily averages steadily drop as the month progresses. Daily averages start off at 22°C and remain constant for the first week. Daily averages then fluctuate between 22°C and 21°C for the following fortnight. By the fourth week of the month, daily averages have dropped down to 20°C and they continue to drop until they reach 18°C by the end of the month. This makes the first week of October the warmest time to visit Cyprus. Although these average temperatures give you a good overview of the weather in Crete, both temperatures and weather can vary greatly depending on which part of the island you’re staying in. The south coast of the island is generally the warmer than the northern coast, with the south east usually being the driest place in October. 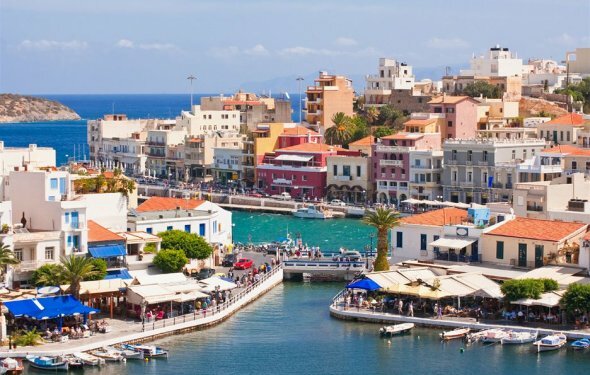 If you love the heat and want to visit Crete when temperatures are at their highest, forget about going in October and plan your holiday for July or August instead, when average temperatures are around 26°C. In October, Crete receives an average of 40mm of precipitation which falls across six wet days. The probability of rainfall rapidly increases as the month progresses, doubling from 15% at the start of the month to 30% by the end. The most common forms of precipitation you should expect to experience in Crete in October are thunderstorms and moderate rain (both of which occur on 39% of days with rainfall), followed by light rain (20%). On average, the western section of Crete is the part of the island most likely to be affected by rainfall in October. The latest offline travel guide to Crete, with loads of information, pictures, and a full offline map. Designed especially for your tablet! Over 210 must see must see locations. Full offline map of Crete with must see locations.